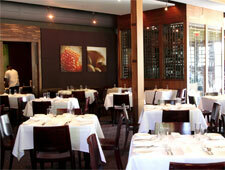 American regional cuisine from chef Randy Evans complemented by a lengthy wine list. : Chef-owner Randy Evans --- former longtime executive chef of Brennan’s of Houston --- takes his farm-to-fork concept to the hilt with his sleek, 5,200-square-foot LEED-certified restaurant. The building was made from refurbished wood, and even the kitchen equipment was recycled. Evans also has his own garden onsite and sources local, seasonal farm produce and meats. The menu changes regularly, but it’s always Texas-style comfort food with a twist. Offerings have included Gulf Coast shrimp corn dogs with Tabasco mash rémoulade for starters, and a field green salad with crunchy fried green tomato croutons and the house black pepper Dijon dressing along with the chef’s take on chicken and dumplings: roasted free-range chicken with bacon spätzle and crispy Brussels sprouts. Desserts include Evans’ grandmother’s layer cake with chocolate malt ice cream and a soothing buttermilk pecan pie. A lengthy wine list focuses on small boutique bottles from around the world, but they have to compete with a bar menu that includes classic cocktails with house-made bitters and infused liquors. A spacious roofed patio makes dining al fresco an option even in the Houston heat, and it’s a fine place to enjoy the Sunday buffet brunch that features made-to-order omelets and fried chicken and waffles. Cove Cold Bar is were chef de cuisine Jean Philippe Gaston serves up raw fish and meats while you watch.